Introducing our newest curriculum designed just for preschool classrooms! Students are taught alphabetic knowledge through FOUR cycles of instruction. Our pilot teachers observed students learn all the basic consonant and vowel sounds after just 26 days of instruction. Written to meet research-based objectives for language and literacy, Jump Start is aligned to Early childhood state standards. Appropriate even for THREE-year olds! The instruction was designed to accommodate single-age and multi-age classrooms by offering differentiated instruction to meet developmental needs. In just 15 minutes a day, students will learn the right skills which lead TO reading gains. 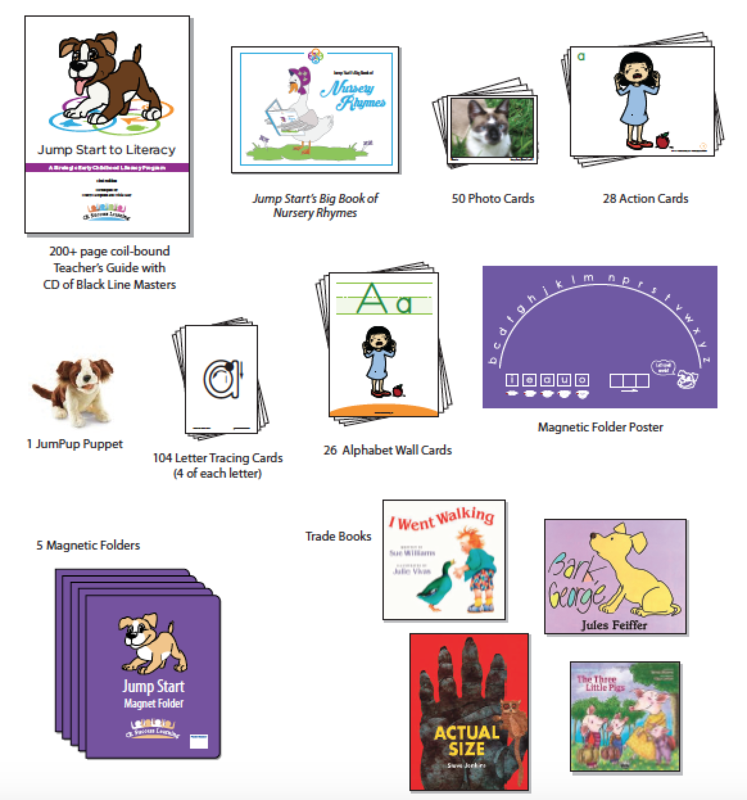 Students who receive Jump Start instruction will enter kindergarten with strong phonemic awareness skills (isolating, segmenting, blending, and manipulating phonemes), motor memory for lowercase letters, mastery of basic Concepts of Print, and automatic recognition of 19 consonants and the 5 short vowel sounds. ONE kit is all you need to deliver research-based literacy practices without replacing your entire program. Preschoolers won’t need to sit still as they sing, dance, play games and use hands-on materials. Each cycle is preceded by suggestions for learning centers, background knowledge for teachers, and ongoing assessment tools to meet every child at their point of need. to a great beginning in literacy. The Jump Start kit, priced at $525, is everything you need. A four-hour professional development to “jump start” your teachers is available.